After an impressive win on opening night, the New York Rangers went into Columbus for a huge rivalry game against the Blue Jackets. The rivalry between these two teams has escalated ever since Rick Nash was traded to New York. Last year both teams got into a few heated matchups. Tonight’s game would not disappoint either as the tensions boiled over on both sides of the ice. The first period was all Blue Jackets as they had possession for most of the period. This led to two straight goals giving the Blue Jackets a 2-0 lead. The first goal came from former Ranger Artem Anisimov, who was sent to Columbus in the Rick Nash trade. Nick Foligno scored the second goal with assists from Ryan Johansen and David Savard. In the second period, the Rangers would answer back as Anthony Duclair beautifully passed the puck to Lee Stampniak for the score cutting Columbus’ lead down to 2-1. Both Duclair and Stampniak had impressive games. Duclair hit a shot off the post that nearly went in. He almost scored on a breakaway as well. Stampniak was all over the ice making his presence felt with his speed and physicality. Even though Stampniak scored, the Blue Jackets came right back with a goal of their own from Cam Atkinson. The big blow came at the end of the 2nd period when Chris Kreider was charged with an instigator penalty for fighting with Jack Skille after his blind hit on Mats Zuccarello. Kreider would be lost for 17 minutes. Down 4-1 in the third period after a Marko Dano goal, Rick Nash scored a goal against his former team. 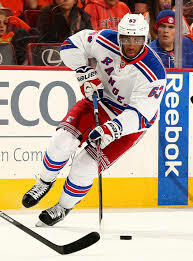 Duclair got his second point and assist of the game with a brilliant pass to set up Nash. With the score 4-2, Alain Vigneault pulled goalie Cam Talbot but that did not help as Cam Atkinson scored his second goal of the game. The Blue Jackets defeated the Rangers by a final score of 5-2. As well as Anthony Duclair and Lee Stampniak played; the same cannot be said for goaltender Cam Talbot. He got off to a rough start giving up 4 goals on 23 attempts. Talbot wasn’t as crisp as he was at the beginning of last season. It’s only the first game and Columbus is a tough team so we will see how he does when he starts his next game. Ryan McDonagh continues to show why he is the Captain of the Rangers. He played very well tonight and almost scored on a steal with his speed down the ice. His evolution is fun to watch. The Rangers were 0-3 on the PP, however they faired pretty well on faceoffs winning 49% of them. The Rangers will play their home opener tomorrow night against the Toronto Maple Leafs. It is a battle between two original six teams. Henrik Lundqvist will be back in goal for the Rangers after Cam Talbot started tonight. Madison Square Garden will be rocking for the first time since the Rangers won Game 4 of the Stanley Cup. The puck hits the ice at 7pm.